After a somewhat dreary start at the Gap, the weather eased up a little and the wind veered from the north to a northeasterly, bringing with it a bit of overhead movement from mid-morning. Personal totals included a Tree Pipit, five Yellow Wagtails, two Grey Wagtails, 197 Meadow Pipits, 83 Swallows, four Sand Martins and 840 House Martins. Six Lesser Black-backed Gulls flew west overhead. Mediterranean Gulls increased to 11, but Common Gulls remained low at four. Sandwich Terns numbered 11 in the roost field. Only half of the site was covered on the ground, since - in terms of grounded migrants - only singles of Whinchat, Whitethroat and Chiffchaff revealed themselves early on and it became clear that vismig was the order of the day. The Treecreeper called in the Plantation and four Skylarks were in the southeastern field. Along the beach were six Oystercatchers and 36 Little Egrets and my wader counts later on included 66 Ringed Plovers, 80 Turnstones and 36 Sanderlings (one juvenile). A Gannet was the only bird of any significance noted in a number of quick scans offshore. 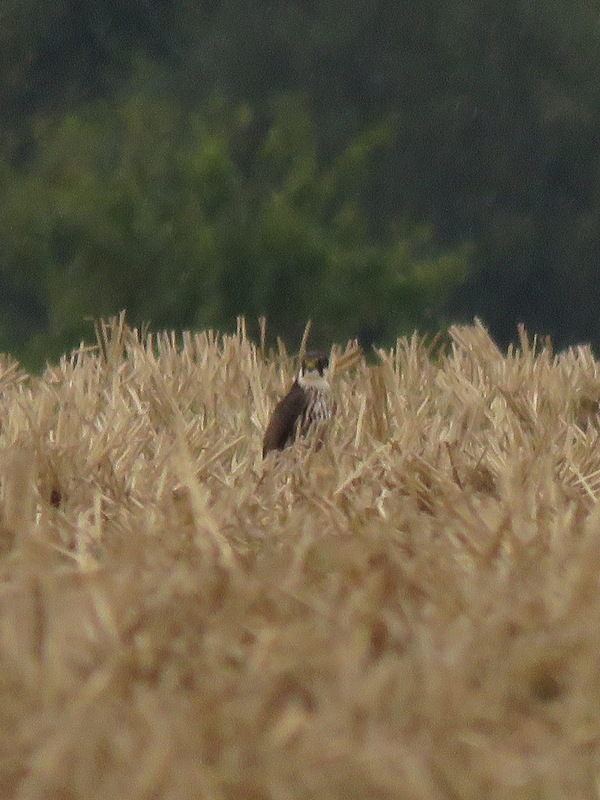 A short, drizzle-hindered walk along the Rife mid-afternoon was rewarded with a Hobby which pitched down in one of the fields, as well as 50 lingering House Martins, a Grey Heron, two Little Egrets, a Common Gull, two Grey Wagtails, 29 Meadow Pipits, and a Sandwich Tern offshore.